No. Buckwheat cannot tolerate cold temperatures. When using buckwheat to improve very poor soil, mixing a balanced organic fertiliser into the soil before planting will give better results. Brussels Sprouts and Kale. Mixes well with upright flowers, and makes an attractive backdrop for herbs. A small bed of buckwheat in bloom will attract numerous beneficial insects. 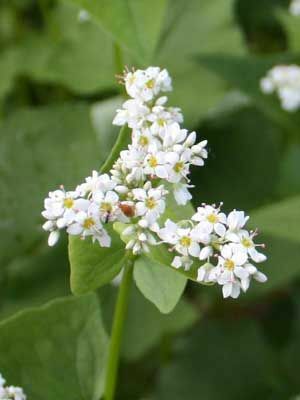 Sow buckwheat from late spring to late summer, whenever a bed will be unused for more than three weeks. Broadcast seed into cultivated soil so that the seeds are about 5 cm (2in) apart and 1 cm (1/2in) deep. Thin to 10 cm (4in) apart in all directions. Limit reseeding by pulling up or turning under buckwheat just after it blooms, but before it develops mature seeds. Buckwheat can be pulled up and composted or turned under any time. It will return the most organic matter when taken down 5 to 6 weeks after seeding. Buckwheat has few problems with pests or diseases.